This is a sweet fun dish that is great for teens with a flair for japan! Its fun and easy to do! 4) When 5 mins is up take out of freezer and get a bowl. Fill bowl with salty water and wet hands. Great idea! Decorated with raisins/apple/nuts would be mush cuter and healthier than a "museli bar". Will try this out on picky little sister. This sounds really good!! 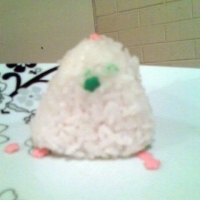 I've always wanted to make onigiri but since I'm allergic to seafood and fish, I can't fill them with anything. But sweet riceballs? That's awesome!! Like lorenadesuu's recipes? Never miss an upload!